In the wine world, it is easy to become inured to vintage hype, but in 2014 the enthusiasm is warranted. Other than some rain early in the season that reduced fruit set in some vineyards, the growing season was pretty much a cakewalk, with hot, dry weather extending from July until the harvest. Thanks to the benign weather, producers were able to pick as they pleased and work with the fruit that they wanted, rather than deal with what Mother Nature handed them, which means were not forced to make harvesting decisions and winemaking adjustments that might not fit their personal styles. With the 2014s you’re going to taste winemakers’ Platonic Pinot Noirs—perfectly clear representations of their respective philosophies, albeit mostly emphatically fruit-driven wines from a warmer-than-average season. If I had any initial trepidation regarding the 2014s, it was that the wines might be a bit too opulent, which has turned out to be the case for some of the ripe, fleshy 2012s. But as the ‘14s have evolved, they are generally showing a lively core of acidity that a number of 2012s lack, which gives them a more energetic, redder-fruit character than most 2012s show today. That’s by no means a knock on the ‘12s but rather an observation that those who fear that 2014 is simply a vintage of large-scaled fruit bombs are going to be pleasantly surprised—even thrilled, in most cases—by the wines’ energy and clarity. Note that a handful of top producers, including Belle Pente, Amalie Robert, Soter, Adelsheim, Shea, J.K. Carriere, Antica Terra, Ponzi, Domaine Serene and Eyrie, had not released their top 2014 bottlings by press time. Those wines will be covered next year. 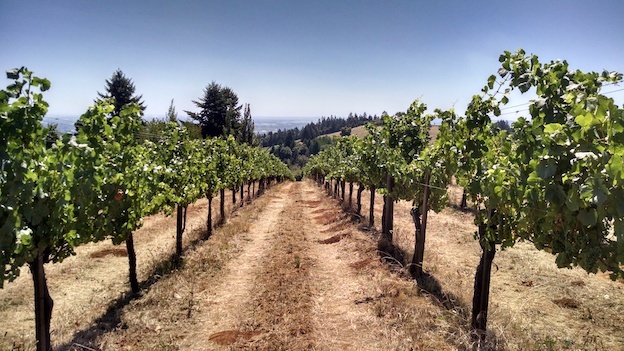 Oregon’s 2013s are a classic example of a vintage largely lost between two better and more consistent years, with two more potentially superb vintages coming down the pike with 2015 and 2016. As I reported last year, 2013 is a wildly variable vintage. What was shaping up to be a warm vintage, with the potential for healthy, ripe fruit, went south quickly thanks to heavy rains during the last week of September. It’s a wildly variable vintage, with quality determined mostly by when a vineyard was picked—either before the late September deluge, perhaps even during the week-long, heavy rain, when the fruit often was not yet fully ripe. Many of the resulting wines can come off as lean and screechy, while some truly superb wines were made from fruit that was picked afterward, well into October, when many sites finally attained full ripeness at moderate sugar levels. 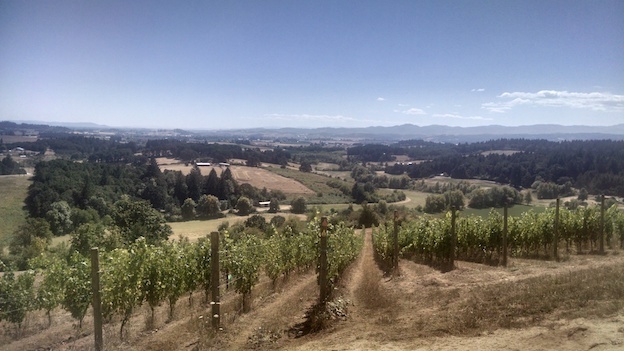 Not surprisingly, the 2013 vintage has divided Oregon Pinot fans, with one side lauding the wines’ mostly racy, low-octane personalities and the other camp criticizing bottlings for being deficient in fruit, texture and weight. If there was ever a set of wines to try before you buy, this would be it. One should have plenty of opportunity to do so as even the best 2013s are likely to move slowly through a market that was already a bit spent by the enthusiasm for the ‘12s and was then rejuvenated by feverish anticipation of the ‘14s. Most of the 2013s included in this report are late releases, thus normally the producers’ best efforts. Many of these wines are of exceptional quality but it’s the rare example that’s opulent, round and deeply fruity in character. Rather, these are mostly wines of structure and detail, the style that will appeal to fans of Oregon Pinot in its graceful, less opulent guise, à la 2011 or 2007. I tasted a number of unfinished 2015s from barrel in Oregon in August and also had the chance to try a handful of early-bottled wines in November in New York. Generally speaking, the wines look to be cut from similar cloth as the 2014s, but with some of the more pronounced opulence of the 2012s, coming as they do from one of the driest and hottest vintages in the State’s winemaking history. The growing season got off to a very fast start, with budbreak taking place about two weeks ahead of schedule. That pace was maintained through the harvest. Irrigation was essential in many young vineyards and rigorous canopy management was essential to protect the fruit from the sun throughout the summer. But there was no disease risk, just the ongoing pressure of keeping yields down and the grapes well shaded. Other than that, 2015 was, as more than one producer described it, a “pinch me: I think I’m dreaming” type of year. Stay tuned. 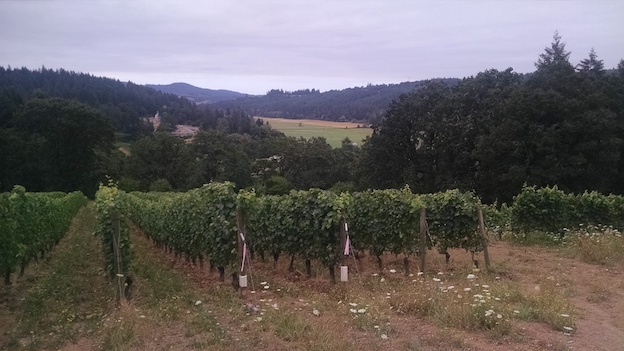 While a number of Oregon’s best Pinots are produced in good quantity and are in relatively wide distribution in the U.S., the frustrating reality is that most of the best wines are made in often pitifully small quantities. As enthused as I am by so many 2014s, that excitement is often tempered by their minuscule production numbers. We’re talking production on the level of Grand Cru Burgundies—as in four barrels (i.e., about a hundred cases of wine) or less for a fairly large number of wines. Whenever possible, we have included case production for these wines, so for particularly scarce objects of your desire, you may want to contact the wineries directly. Speaking of Burgundy, compared to the prices being asked for those wines today, Oregon’s best Pinots are delivering astounding value. Astronomical Burgundy prices are largely a function of the extreme weather events and subsequent very low crop levels that much of Burgundy has suffered through the last several vintages. And it’s not just the wine that’s gotten expensive, as land prices on the Côte d’Or are at sky-high levels now and most small, independent Burgundy growers have simply been priced out of their own real estate market. Nature—and wine production—abhors a vacuum and a growing number of Burgundy producers have been dipping their toes into the Oregon Pinot pond over the last couple decades, and especially since the turn of the new century. Domaine Drouhin took the lead, producing their first Oregon wine in 1988, and in recent years serious projects have been established by big names like Louis Jadot, Dominique Lafon, Méo-Camuzet, Liger-Belair and Domaine Marc Roy. In addition, a number of highly talented and experienced Burgundy-trained winemakers such as Isabelle Meunier (Lavinea), Thomas Savre (Lingua Franca) and Jacques Tardy (Torii Mor) settled in Oregon and have been producing wines that, unsurprisingly, lean in an Old World direction. Their wines have only served to increase the diversity of styles available to consumers. I expect this trend to accelerate in the coming years as the wider wine world becomes aware of the enormous potential that’s offered by—and increasingly realized in—Oregon. Many of these wines were tasted at producers’ wineries during my annual trip to Oregon in August as well as in New York this fall.